This Rectangular Cocktail Table offers a dark brown finish, large scale, and sleek straight lines that give it a very modern feel. 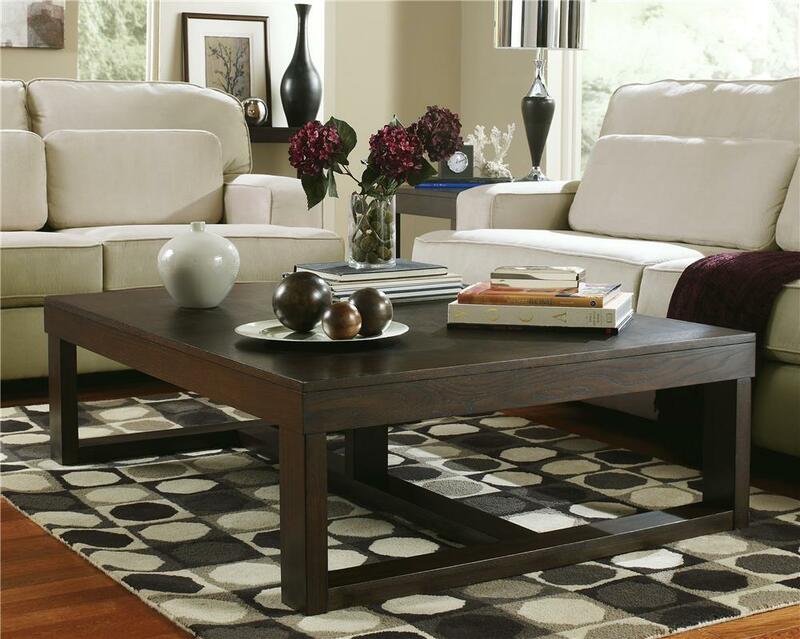 This table is sure to add a new level of style and function to your living room. Paired with the matching End and Sofa Tables this set is enough to make your living room stand out. The Watson Rectangular Coffee Table by Signature Design by Ashley at Prime Brothers Furniture in the Bay City, Saginaw, Midland, Michigan area. Product availability may vary. Contact us for the most current availability on this product. Wood & Finish Constructed from hardwood solids and ash veneers. Clean design finished in dark brown stained finish. Case Construction Constructed from quality hardwood solids and veneers. With the straight-lined design and rich dark finish that truly enhances the contemporary style, This collection adds an artistic beauty to any decor. The rustic feel of the ash veneer is bathed in a stylish dark brown finish that flows smoothly over the contemporary styling of the straight-edge legs and table top. With the subtle curve of the chair backs and faux leather upholstered seat and back, the chairs beautifully complement the exciting contemporary design of this furniture collection. Create a refreshing experience with the grand contemporary design of this collection. The Watson collection is a great option if you are looking for Contemporary furniture in the Bay City, Saginaw, Midland, Michigan area. Browse other items in the Watson collection from Prime Brothers Furniture in the Bay City, Saginaw, Midland, Michigan area.